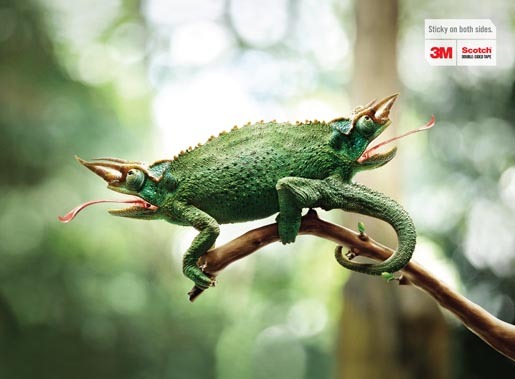 Scotch Double Sided Tape by 3M was promoted in a pair of print and outdoor advertisements in India featuring the tongues of the chameleon and frog. At the tip of a chameleon’s long tongue there is a muscular structure covered in thick mucus that forms a suction cup. Once the prey sticks to the tip, it is unable to break free and is quickly drawn back into the mouth. A frog’s tongue is coated with thick saliva that helps to catch its prey. An important adaptation, it allows frogs to feed even in a split second. Once the prey is held in its sticky tongue, it is incapable of breaking loose. A two-headed chameleon and a two-headed frog are associated with the phrase, “Stick on both sides”. 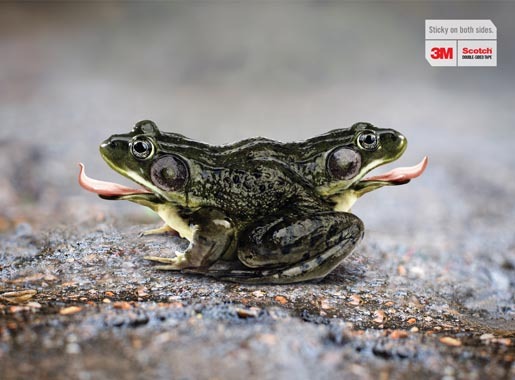 The Sticky on Both Sides campaign was developed at Grey Group India, New Delhi, by creative directors Amit Shankar, Uddalak Gupta, copywriter Mohit Dabral and art director Vikash Kumar Ravi.